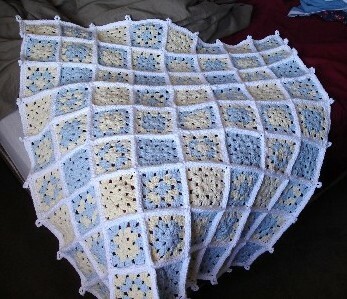 The pattern is a granny square blanket. There are six varieties that form the pattern seen here. You may choose to use one variation for the whole blanket, or maybe two or three. I will give directions for all six variations. Ch 3, yo, insert hook in first Ch, DC in that ch 2 times to form a cluster of three. Join with slip stitch in any corner ch2 space. join with SC in any corner ch 2 space. repeat from * on each side. Next round Color A cont. Next round Color C cont. you may use whip stitch if you so prefer. Then I put four 6 square panels together to make a 24 square panel 8 squares wide and 3 squares high. Then I put the three 24 square panels together to form a blanket that was 9 squares high and 8 squares wide. Join with SC at any corner. SC around until you come to the join of two squares. Pattern designed by Tamara Bower-Snow, who owns Roxycraft.com where you will find more free crochet patterns plus original exclusive patterns reasonably priced to purchase.